A bright beautiful morning greeted us as we sat enjoying the best coffee we'd had in a while on our little patio area at the back of our room. The patio looked out into a courtyard of sorts where the pool to the hotel in front of us was off to our left a bit and a backyard to another B&B or a residence, I could never decide which it was. They hung out laundry almost daily but a lot seemed to be personal items. Between the two buildings though was a break with a spectacular view of the sea and a little bit of the caldera--the desired view of visitors to Santorini. The main island of Santorini is curved around the two volcanic small islands in the middle of what is called the Caldera. A caldera is a large crater formed by volcanic explosion or the collapse of a volcanic cone. In this case, the ocean filled in the crater creating a picturesque area with spectacular views all the way around. The last eruption of the volcanoes was in the 1940s. As we finished the last of our coffee, we studied the map our Greek rental car friend had marked for us and decided to divide the island up into four sections and do one a day. That would give us lots of time to linger where we wanted to stay longer and let us also have plenty of time to just kick back and relax at Casa Bianca. Camera bag on my back, water bottle in hand, we headed for where we had left the car, in front of the school and across from the church. 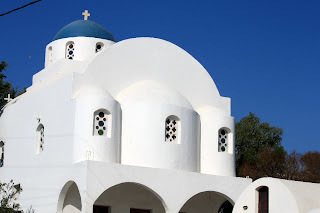 The churches in Santorini are distinctly white (although we saw a handful of pastel colored ones) with a blue dome. On this small island, there are well over 200 churches. One doesn't have to walk far to find a place of worship which is good because walking is the only way to get around in many places and then it is up and down steps--lots of steps. When we got to the car, I was amazed at what little space there was to maneuver. 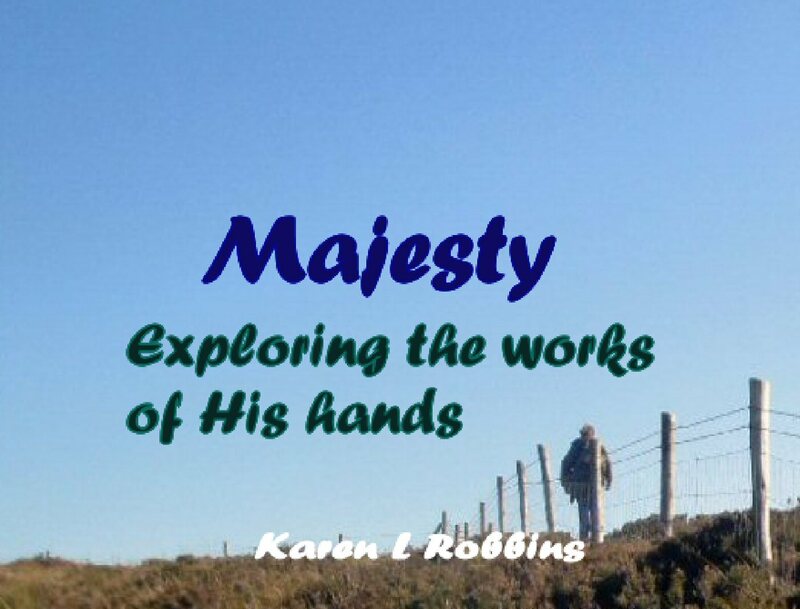 Had we really made it here without bumping into anything? We jiggled out of the parking spot and down the little hill praying all the way that we wouldn't meet another car coming the opposite direction. After a turn onto the road we were to take, I looked down a huge hill. Had we really navigated that last night? 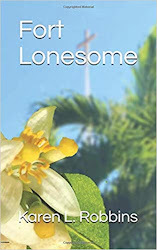 I imagined what I felt was like a drunk who wakes up to discover he's somewhere and has no idea how he got there. Thankfully the area we chose to explore the first day was not one that was extremely busy. To the north of Imerovigli the island curves around and there was a little town called Oia that we headed to. 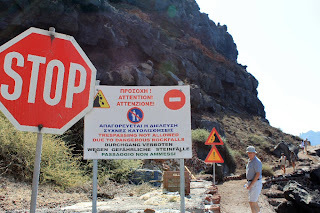 We drove through the narrow streets and followed the signs that led to Amoudi Bay, a place to see and find a good meal according to Maria our B&B host. Finding a good place to park was a little more of a challenge. We squeezed into a spot and continued on down the road to the steps and then down to the harbor. The day could not have been more perfect. It was warm but a cool breeze blew off the water. The narrow walkway was bordered by water and shops and restaurants. I think one of the places may have been a small fish market as well. They were just beginning to serve lunch and all the grills along the way were getting fired up. 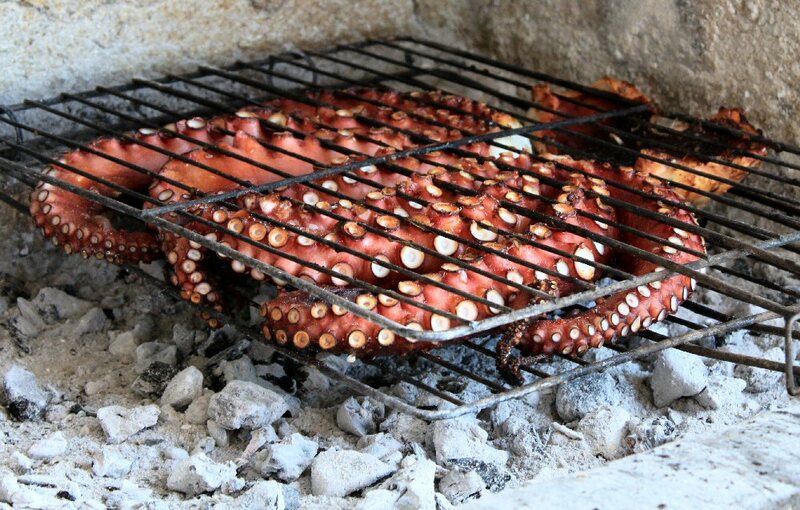 We decided to pass on the grilled octopus. There was a grilled fish that looked perfectly done and I would have loved to have sampled it but by the time I saw it, we had already ordered. Our appetizer was something called tomato balls which were more like crab cakes only with tomatoes rather than crab meat. They were okay. 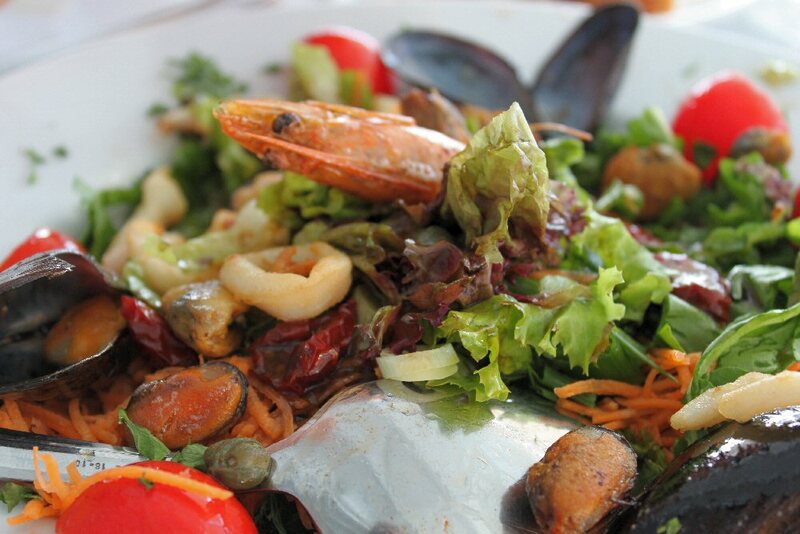 The next course, our seafood salad made up for them. Fresh garden greens and veggies and assorted grilled seafood. Heavenly. During lunch, we had watched a steady stream of people walking a pathway to the cliffs next to us. There was even a bridal couple accompanied by a photographer who braved the rough trail. Curious, we decided to follow the trail to see where it led. Of course to do so, we had to ignore the sign. It was a bit treacherous in parts but it ended up near a place where you could climb down into the water. I think some may have been snorkeling there. And on the little island that jutted out nearby, there were boys diving off the cliffs. We watched for a bit and returned the way we came. On our way back to the car, we noticed a pathway with steps that led straight up the cliff. 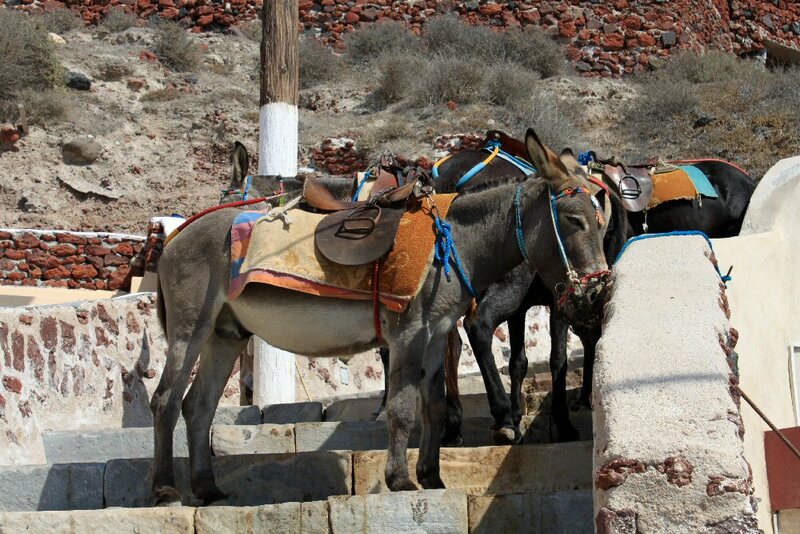 There on the steps were several donkeys waiting to take passengers and/or cargo to the top. Donkeys are used in several places around Santorini where there is a harbor and people need to get up to the town above. 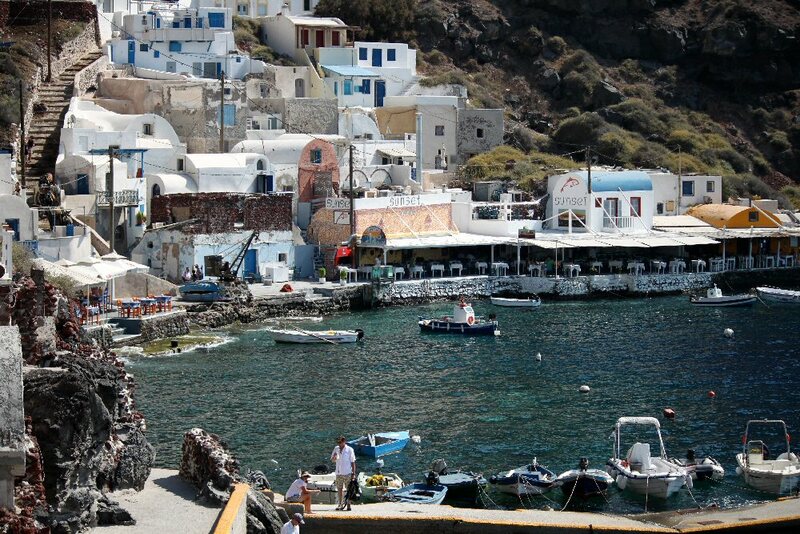 If you cruise to Santorini that is your choice in the old port where many of the tenders dock. You can take a funicular to the top or ride a donkey. One side of Santorini is very hilly and the other is very flat. That flat side has most of the beaches. 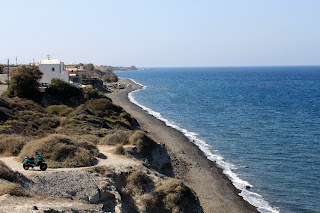 We drove along the flat side to return to Casa Bianca and stopped to admire one of the black beaches. There was no easy way to get down to it so we admired from afar. The black sand and/or pebbles are from lava. We spent what was left of our afternoon napping and reading. After all, we'd just finished a two week long cruise. Seriously, the heat and all the climbing can get to you and we wanted to enjoy one of the best things this island had to offer--a sunset over the caldera. 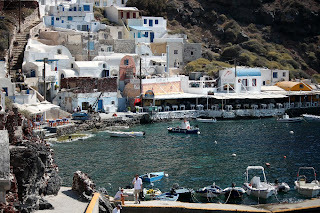 In Fira, there are lots of places along the walkway in front of the cathedral and beyond where you can stand, or sit in a cafe or restaurant and watch the sun set over the volcanic islands in the caldera. We found a cafe and sat at a table sipping fresh tropical drinks (mine was mango!) 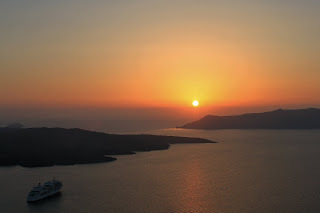 and watched the cruise ships weigh anchor and the sun dip down behind the volcano. Dinner and then a drive through the crowded narrow streets of Fira navigating around people and cars and motorbikes. 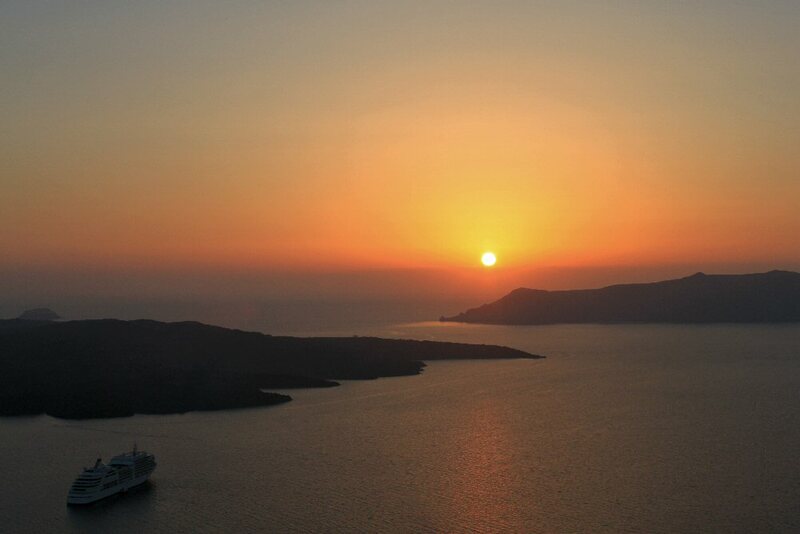 An exciting time and the end of our first full day in Santorini. What would tomorrow hold?